Don't get me wrong, compared to other blogs, 175K visitors is nothing. But for someone who is not an expert in Social Media Marketing, having over 99K visitors in a single year feels kind of good. In case you are planning to start a technical blog, I have some tips I would like to share with you. "Motivation gets you started; Consistency takes you to the finish line." I heard those words from Denzel Washington about a week ago. And I can't agree more. It is easy to start a blog and post three or five articles. But very few keep on writing year after year. Blogging is hard work which pays nothing in return. It requires more than motivation to keep going; it requires Consistency. And the best way to be consistent is to know your WHY. Sometime around 2013, I was feeling lost, depressed and overweight. It was a bad period in my life to the point that I ended up seeing a therapist. After my first session with her, she told me "Go and do something nice for yourself." I wasn't expecting those words from her. Somehow, those were the words I needed to hear. As I left her office, I noticed that right next door was a small gym. Without thinking about it, I went in and decided to change my lifestyle, workout and be healthy. I was so focused on my goal. I started eating healthy and ran daily. About six miles a day. Within eight months, I went from 210 lbs to 160 lbs. This wasn't the first time I had tried to lose weight. Nope, not at all. I have always been very active, but for some reason, the fat didn't want to go away. But what was different this time was my mindset. My mindset went from "I want to have abs" to "I want to be healthy." By changing my mindset, I had translated my WHY to have a higher purpose. I no longer cared for abs, I cared about my well being. Whatever you start, a blog, a project, etc., try to find out WHY you are doing it. It is the "WHY" that will help you keep going when you are most likely to throw the towel. One of the things that may paralyze you is the question: "What should I blog about?" My answer to you is, pick a niche, a particular niche that no one has dared to blog about, and start writing about it. Do not worry about the traffic. If you genuinely care about helping people in that niche, go ahead and do it. 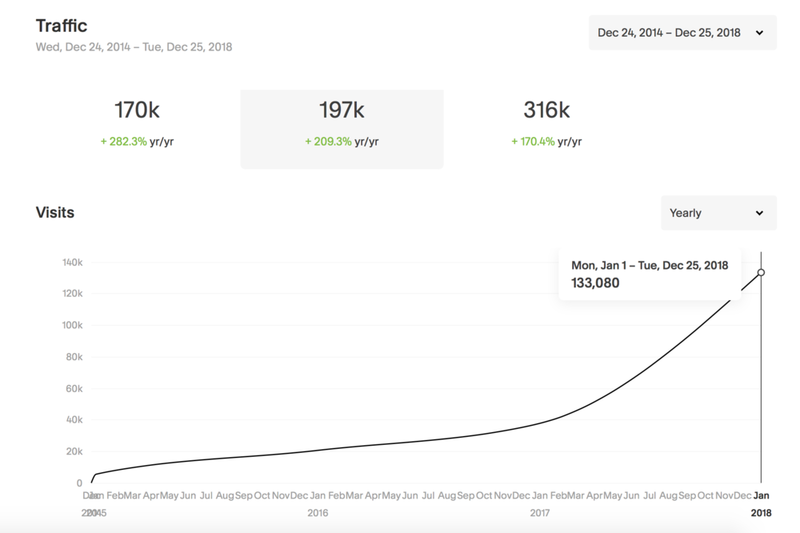 I never imagined that blogging about Game Engine Development was going to bring in 99K visitors organically in a single year. NEVER. But somehow it did. Simply start writing. If your content truly helps people, they will come. If you genuinely want to help people, people will be attracted to your blog. If every piece of content is aimed to teach, help, and improve someone's life, people will take notice. If you post content that clearly shows that you did not put any thought in it, people will not come. It is as simple as that. If you read my blog, 90% of articles are about teaching Game Engine Development. 10% of articles are about sharing the progress of my game engine, Untold Engine. Not surprisingly, the articles with the highest visits and comments are the ones where I teach. Show through your content that you care, and people will visit you. The whole purpose of social media (blogging being one of them) is to share knowledge and help improve people's lives.